Long before North America was discovered by the Europeans, there was a network of trails that the aboriginal people used for trade and travel from the west coast into the interior of British Columbia. One of the many staple trading items was the Eulachon (oolichan), a small fish that was dried or rendered into fat. This Eulachon grease was carried inland along trails that are now called "grease trails". The first European to make the trek across the North American continent was Alexander Mackenzie as he searched for the Northwest Passage. Mackenzie's trek in 1793, preceded the famous Lewis and Clark expedition by twelve years. Alexander Mackenzie, who was born in Scotland in 1764, worked in the fur trade business for the North West Company, and by the year 1779 he was in command of the Athabasca country. 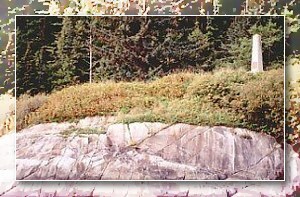 Mackenzie made Fort Chipewyan on the shores of Lake Athabasca the base for exploring a water route to the Pacific. In the fall of 1792, Mackenzie and his party left Fort Chipewyan in their search for the North West Passage. After wintering at Fort Fork (close to the Peace River) on May 9th, 1793 Alexander Mackenzie, his party of nine men and one canoe started on their trek up the Peace River to the fork of the Finlay and Parsnip Rivers. They took the Parsnip River, crossed the continental divide, and eventually canoed down the Fraser River to Alexandria just south of Quesnel. On the advice of local First Nations people, who guided Mackenzie and his party to the Pacific Ocean, they gave up the river route for an overland one. The overland journey started just above the mouth of the Blackwater River (West Road River) west of Quesnel taking them through the Upper Blackwater, along the Eliguk and Gatcho Lakes, through parts of what is now Tweedsmuir Park, over the Rainbow Mountains, into the Bella Coola Valley and "Friendly Village". The local people took the group down the Bella Coola River, over the salt water into the Dean Channel and on a rock, Mackenzie inscribed the following, "Alexander Mackenzie, from Canada, by land, the twenty-second of July, one thousand, seven hundred and ninety-three." The Alexander Mackenzie Heritage Trail was designated as a heritage trail under the Heritage Conservation Act and as a forest recreation trail under the Forest Act, in 1987. This trail located in the Cariboo Chilcotin Coast region of British Columbia, is a 450 km (279 mi.) long corridor that starts at the mouth of the Blackwater river, just west of Quesnel and stretches all the way to the Sir Alexander Mackenzie Provincial Park in the Dean Channel. It is made up of highways, forest access roads, local wagon roads, rivers and coastal waters. At the east end trail head, sections of the trail are actual gravel forest roads, further west they turn into horse trails and wagon roads. This area is intersected with parts of the original trail. It becomes an alpine trail in Tweedsmuir park, then a paved highway, a river and finally a fjord. This important historic trail tells the story of the aboriginal people dating back 6000 years. There are some 120 recorder prehistoric archaeological sites near the trail and 260 within a mile or two. The history story continues, as it relates to the fur trading, the gold rush, ranching, guiding, fishing and forestry in this region. To reach The Alexander Mackenzie Heritage Trail from Quesnel ( on Highway 97) take the Moffat Bridge over the Fraser River to West Quesnel. Turn right heading to Bouchie Lake. From Bouchie Lake turn right on the Blackwater Road going by Pantage Lake to lower Blackwater bridge. The original trail starts where the Blackwater River meets the Fraser River. The heritage trail takes you to some very interested spots such as Punchaw Lake, Blackwater Bridge, Gillies Crossing, Titetown, and Pan Meadows. The trail follows along Euchiniko Lake and into the Kluskus Lakes territory as you head into the Upper Blackwater. As it continues it will take you by Eliguk Lake, Gatcho Lake, Dean River crossing, Tanya Lakes, into the Mackenzie Valley, Burnt Bridge Creek and into the Bella Coola Valley. This 450 km (279 mi.) hike is extremely strenuous, time consuming and for experts. The hike will take you three weeks, so be well prepared and completely self reliant. Parts of the hike through Tweedsmuir Provincial Park are isolated, so it is best to hike with at least three people Be prepared for the worst possible weather conditions and pack as light as possible. One food supply drop halfway is essential, make these arrangements well in advance. There are numerous shorter hiking trips you can take. Make use of the fly-in or fly-out excursion trips available. Drive out to Nimpo Lake on Highway 20 and fly out to Pan's fish camp or one of the other camps and hike the assorted trails, or hike west to the Dean River, Mackenzie Pass to the Bella Coola Valley. Another suggestion is to hike out from the trail head at the Lower Blackwater River and make arrangements to be picked up at Eliguk Lake, Gatcho Lake or Tanya Lakes. There are several excellent day or weekend hiking trips you can take that start in the Lower Blackwater River region. There's the Lower Blackwater Bridge day trip that includes sections of the Mackenzie Trail and the Telegraph Trails. The Euchiniko River Loop Trails can be a day trip, or make it a weekend hike. Another day trip is the drive through the Nazko Valley. The Old Kluskus Road is a four-wheel drive day trip between Lower Blackwater Bridge and Gillies Crossing. An excellent day hike at Bella Coola is the Valley Loop Trail. This hike of 5 km (3.1 mi.) starts at Burnt Bridge Creek and in part follows the Mackenzie Heritage Trail. Horseback trips and rubber-tired wagon trips can be arranged through packers in the Cariboo or Chilcotin. Much of the Blackwater River Route has been used by horse and wagon since the late 1890's, and many of these trails are still in use. The appeal of the Alexander Mackenzie Heritage Trail/Nuxalk-Carrier Grease Trail means the opportunity to hike, backpack, or horseback ride a remote historic trail and walk in the footsteps of Alexander Mackenzie, the voyageurs and aboriginal people.